We check the motor's amps, volts and capacitance. We pressure check all pumps. We test most controls, from simple timers and freeze-guards to the most sophisticated electronic controls. We repair all types of automatic pool cleaners. We will provide a list of options and let you make the decision for repair or replacement as needed. If you think you have a problem, call us first and let us provide expert assistance. 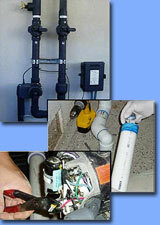 We offer leak detection, including underground pressure testing. We test for proper water flow & sustained heat output. We check for gas safety and adequate venting. We check for leaks, broken elements and poor filtration. We also test for internal leaks. We can evaluate your salt-water chlorination system and determine if it is malfunctioning or a simply matter of poor water chemistry. Call us today for any professional repairs or installations for your commercial or residential pool. We offer expert repair on any electrical, mechanical, structural, and plumbing issues you may have with your swimming pool. Our repairs and installations are completed to the manufactures specification by professional swimming pool technicians.